This is one of the most unique hikes I have ever had the fun of hiking. Lava Canyon is a relic of the past activity of Mt St Helens. On this hike you will clearly see 2 main lava events, one upon the other. The trail wanders through this geological phenomenon in an enjoyable way. There are ladders to climb and bridges to cross. Use extreme caution, especially when the trail is wet, and always stay on the designated trail. The trail begins as a Universal Access Trail for the first 1/2 mile. Then you will come to a junction. You will return to this junction via the trail to the left, but for now, bear right and follow the trail over a bridge which spans a narrow section of the Muddy River. 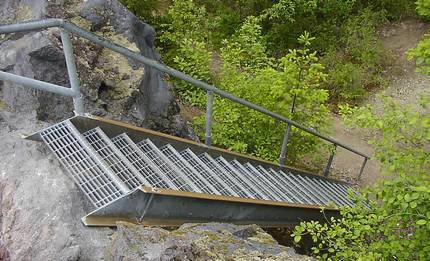 Next you will have to descend a short steep ladder, and then a long suspension bridge. After crossing the suspension bridge, bear right and follow the trail on a steep descent into the Muddy River valley toward Smith Creek. You will pass several waterfalls and spectacular cascades. The trail is steep and narrow in places, so use utmost care. If the trail is wet, it may be best to NOT PROCEED. In about a mile, after crossing a couple small streams, and descending a tall steep ladder, you will come to a junction to Trail #184B. 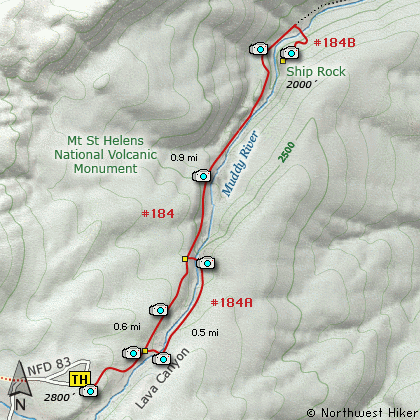 Follow this trail uphill and up another short but steep ladder to the top of Ship Rock. Here you will enjoy excellent views of Lava Canyon and several of its waterfalls. Upon return, when you reach the suspension bridge, bear right this time, and instead of crossing the bridge, follow the trail up to the junction you passed earlier on your trip down the canyon. At this point just follow the UA Trail back to the trail head. From the junction with I-5 follow SR503 east from Woodland, WA approximately 23 miles to the junction of the Lewis River Road with SR503. Continue east on the Lewis River Road another 4.4 miles to the junction of Forest Road 81 just before you get to Cougar. Continue east through Cougar on the Lewis River Road, which becomes Forest Road 90, for about 7.4 miles to the junction of Forest Roads 90 and 83. Turn left on FR83. In about	1.7 miles you will pass the road that leads to the Ape Caves, but continue north on FR83. In another 1.3 miles you will pass the junction to Forest Road 81, but bear right and continue on FR83. In about 3.8 miles you will pass the parking area for the June Lake hike, but continue on another 4.3 miles to the parking area for Lava Canyon. Note: You will pass the trailhead for the Ape Canyon hike just before you reach the parking area for Lava Canyon. Don't confuse them.